Yoga before bed can be some of your best defense against insomnia. By calming down your body and your mind, you’re putting yourself in a better position for sweet and restful slumber. Ready to get to bed? This yoga sequence will save the day. Kneel on your mat with your knees hips-width distance apart and your big toes touching behind you. Take a deep breath in and, as you exhale, lay your torso over your thighs. Try to lengthen your neck and spine by drawing your ribs away from your tailbone and the crown of your head away from your shoulders. >>>Free 6 week meal plan. Download it now! Stand at the top of your mat in Mountain Pose at the front of your mat. Inhale and reach your arms straight above you. From Standing Forward Bend, slowly roll up vertebrae by vertebrae until you’re standing at the top of your mat. Stand with your feet three to four feet apart, placing your heels slightly wider than your toes. Fold forward, hinging at your hips, drawing the crown of your head and your hands toward the floor. Relax your toes, and try to shift the weight of your hips forward so they’re in line with your feet. >>>Free fat burning workouts. Get them every day! 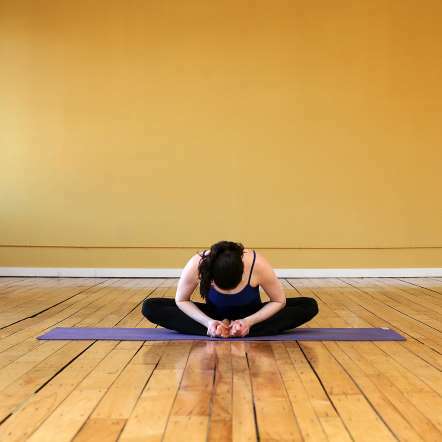 From Wide-Legged Forward Bend C, sit on the floor, bend both knees, and bring your feet together. Using your hands, open your feet up like a book, pressing your knees toward the floor with your elbows. If you want more of a stretch, extend your arms out in front of you. From Butterfly Pose, allow your legs to straighten out into a straddle position with three to four feet between your heels. Make sure your toes and knees are pointing straight up. Sit with a tall spine or slowly fold forward at your hips, pressing your belly button and chest forward to prevent your back from rounding. Either support the weight of your torso with your hands on your legs or feet, or rest them out in front of you. Hold for 10 breaths. Come up slowly from Seated Straddle, and bring your both your legs straight out in front of you. Shake them out for a moment. Bend your right knee, and place the sole of your foot against your inner thigh, pulling your heel as close to your body as you can. Inhale to sit up tall, and exhale as you fold your torso over your left leg. Rest your hands on the floor on either side of your leg, place them on your shin, or wrap your hands around your left foot. Stay here for 10 breaths, sit up, and repeat this pose on the left side. From Head to Knee Pose A, lie flat on your back with your arms along the sides of your body, with your palms facing down. Bend your knees, placing your heels as close as you can to your bum. With your palms and feet pressing firmly into the ground, lift your hips up. Keep your palms on the mat or clasp your hands together below your pelvis, extending through your arms. Or you can also bend your elbows and rest your hands on your lower back. If your feet are close enough, you can also hold your ankles. Stay here for 10 deep breaths, lifting your hips as high as you can. Once you’ve come out of Bridge Pose, sit up and place a folded bolster, blanket, or pillow against a wall.Sit down as close as you can to the wall, next to the blanket. Lie down on your back, place your feet on the wall with your knees bent, and scoot your body over so that your bottom and lower back are on the blanket. Sit with your bottom touching the wall, and then place your feet straight up, resting your heels on the wall. You can keep your arms by your sides, or by your head (this position will stretch your shoulders). Close you eyes and allow your entire body to relax, feeling gravity pulling you down as the wall and blanket support you. Hold for 30 seconds, then roll your body over to one side with your knees bent, and rest your head on the inside of your arm, staying like this in fetal position for a minute or so. Then you can roll up onto your knees and come to stand up. Lie on your back and wrap your left toes around the back of your right ankle, just like in Eagle Pose. Slowly lower both knees to the left. Rest them on the ground and turn your head to the right. Use your abs to lift your knees back to center. Uncross your legs and cross them the opposite way, with your left knee on top. Slowly lower both knees to the right, and look over your left shoulder. After five breaths, release, and head into your final pose. Lie on your back and close your eyes. In order to relax and open your body fully, extend your arms a few inches away from the body, with the palms facing up. Put about 15 to 20 inches between your heels, allowing your feet to fall open with the toes pointing out. Actively shrug your shoulder blades down toward your hips. Lengthen through the spine as much as possible, relaxing your lower back toward the floor. After you’ve found a comfortable position, stay here for as long as you want, around 10 minutes or more, if your schedule allows for it. If you’re short on time, remain in Savasana at least until your heart rate slows down and your breath returns to its natural, soothing rhythm. >>>Free fat burning workouts emailed to you daily! Sign up now!